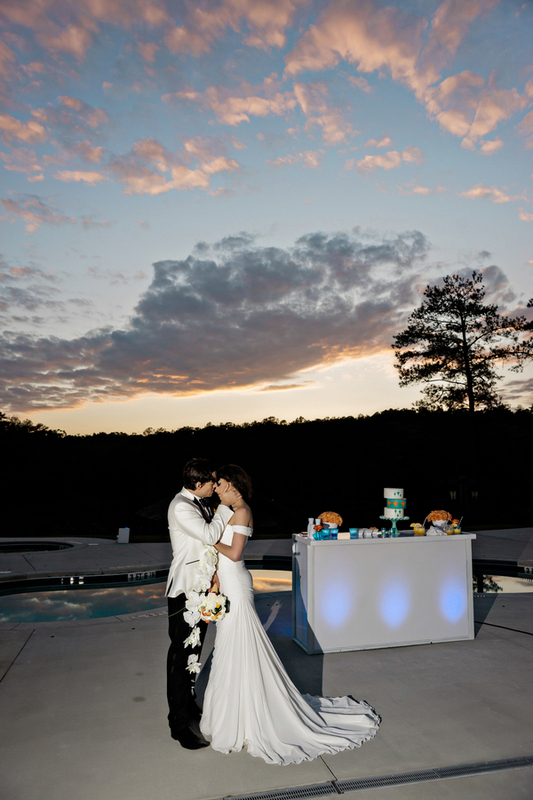 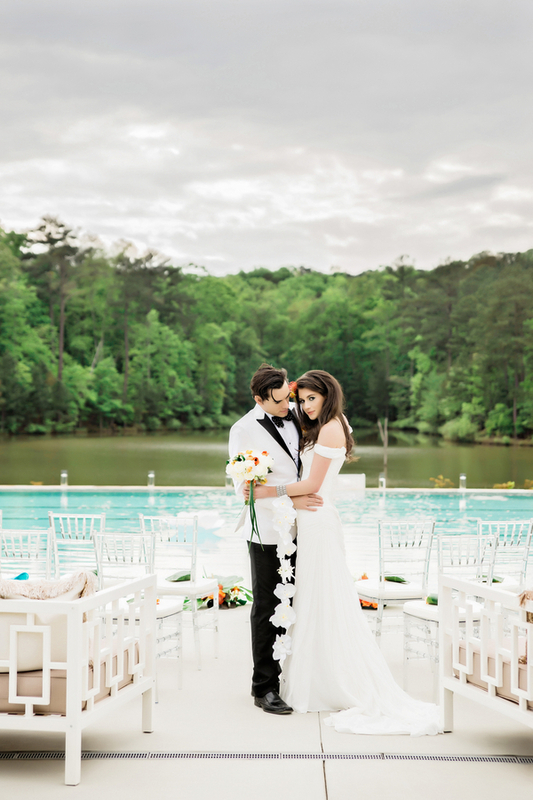 Foxhall Resort and Sporting Club is a beautiful venue just outside of Atlanta, GA. 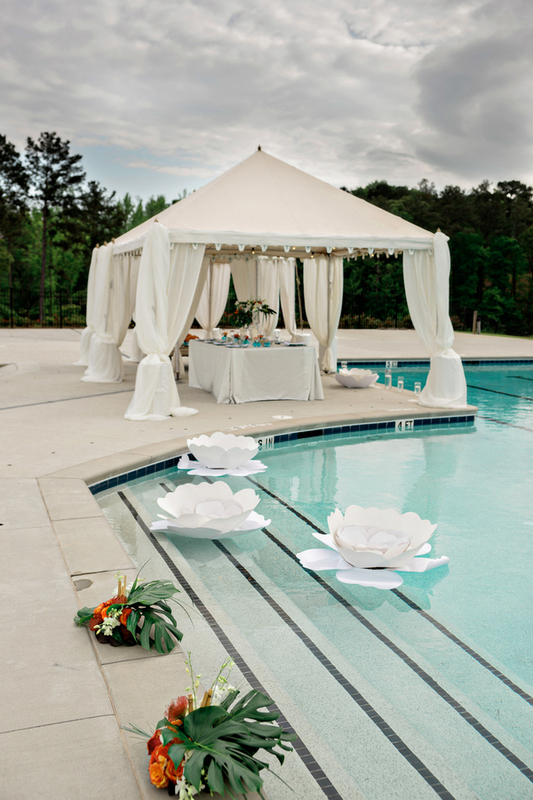 Known for the beauty of their stables, they’ve added a new pool space that’s now booking weddings and events! 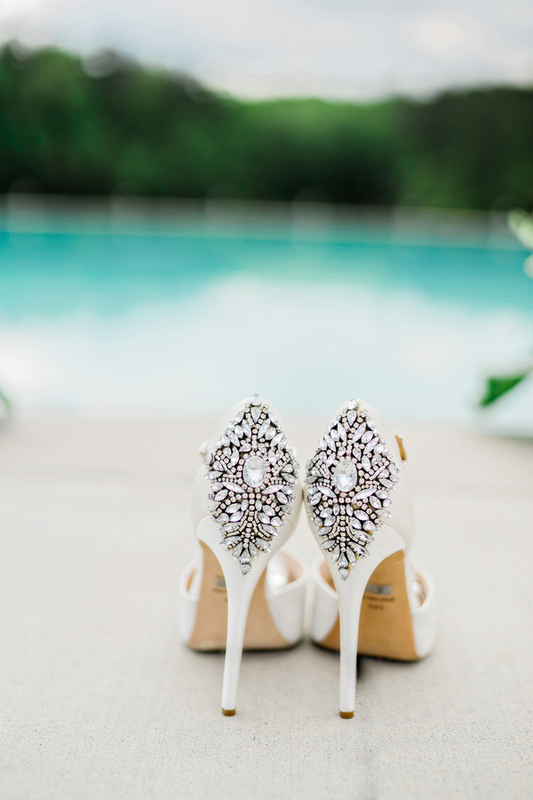 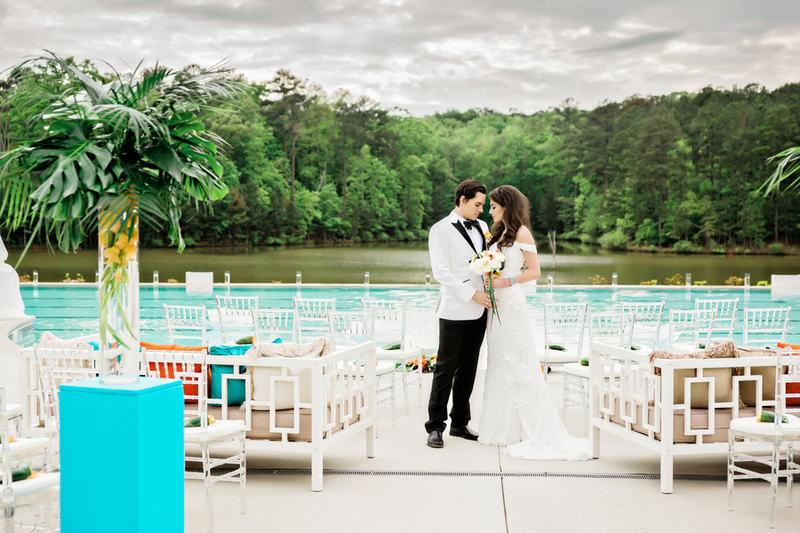 Overlooking the lake, the tropical pool area is the perfect space for a summer wedding! 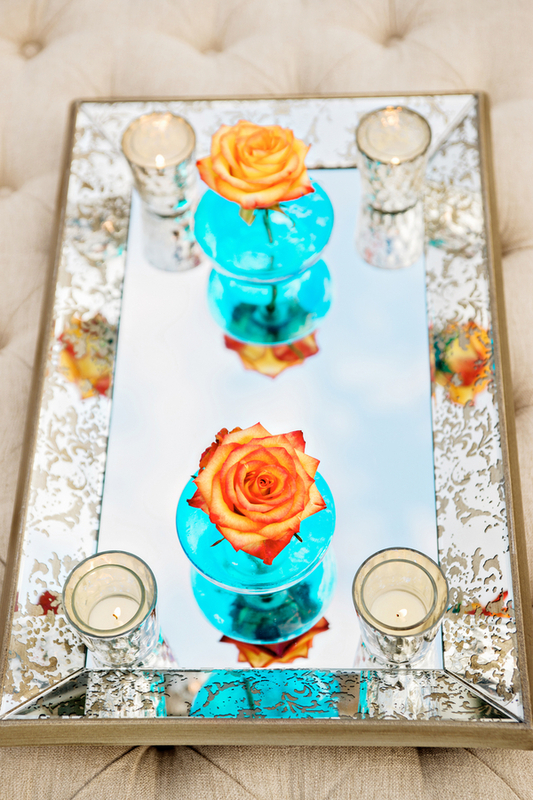 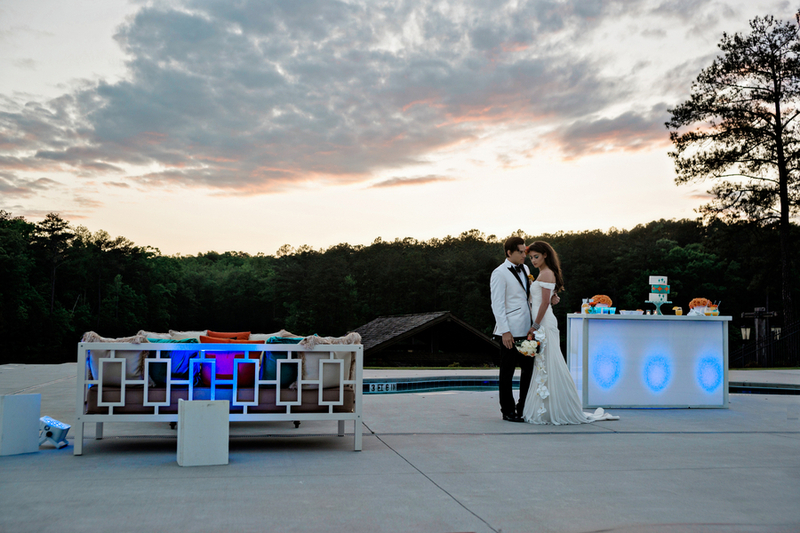 To capture the beauty of this new space, My Dreamz Eventz went above and beyond to create a magical styled shoot. 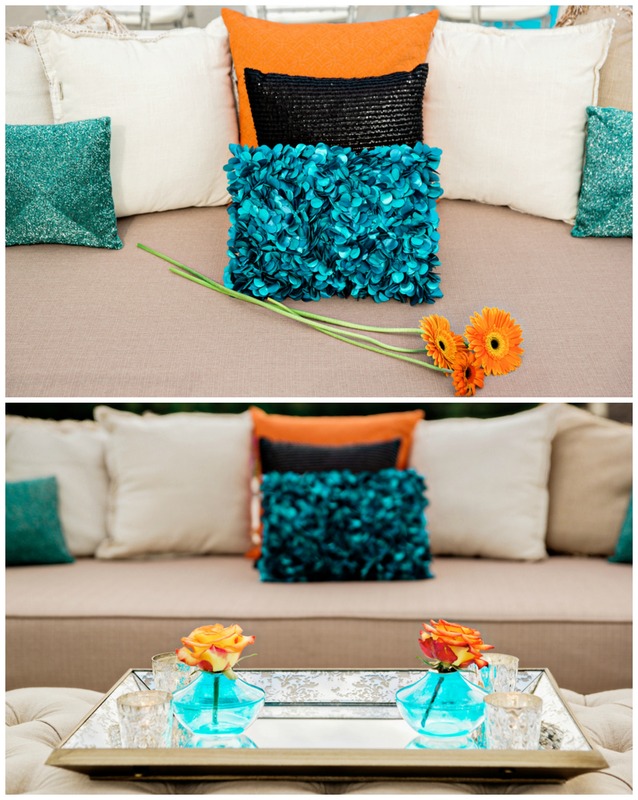 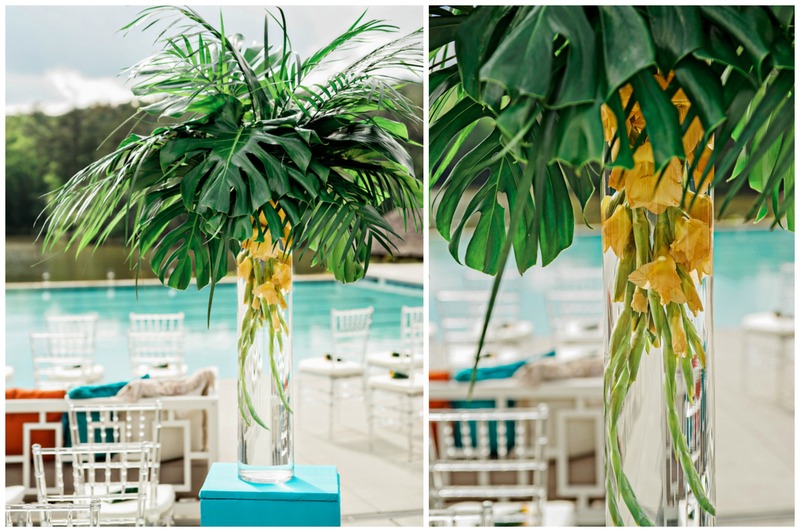 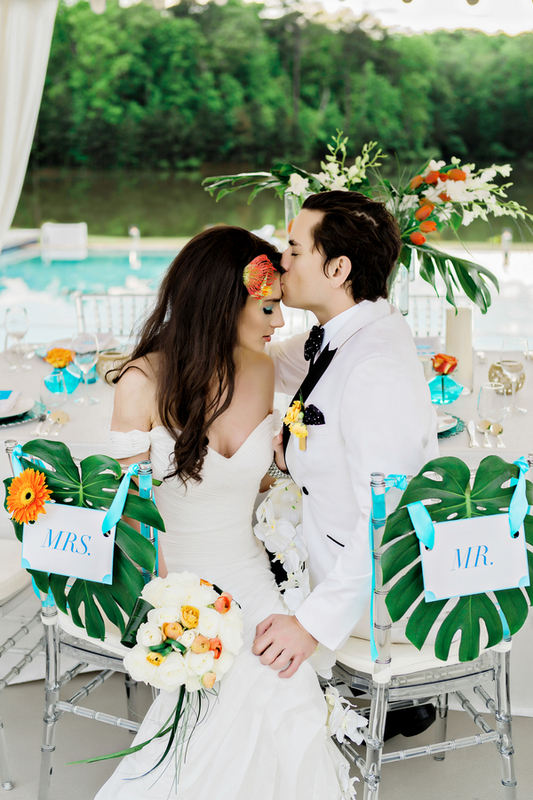 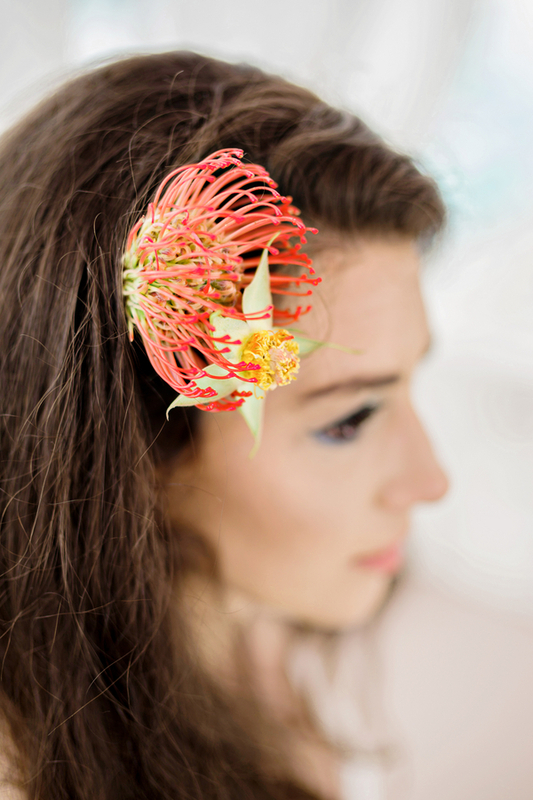 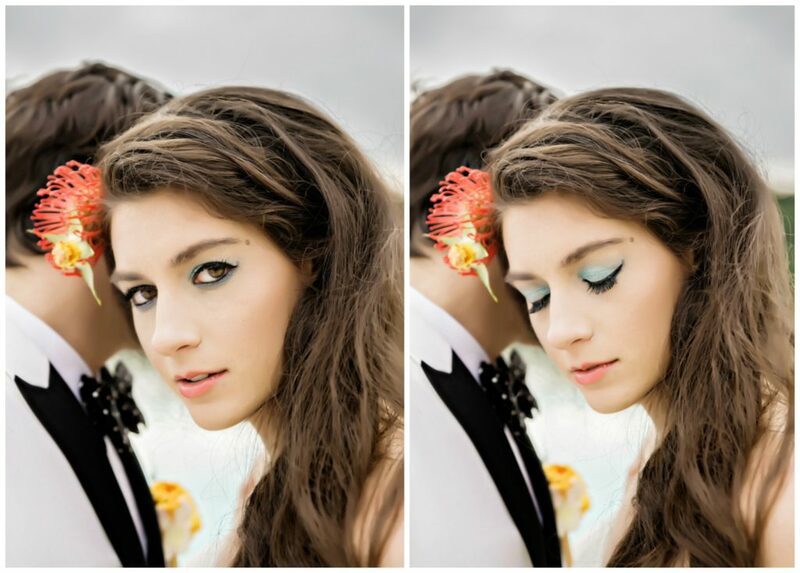 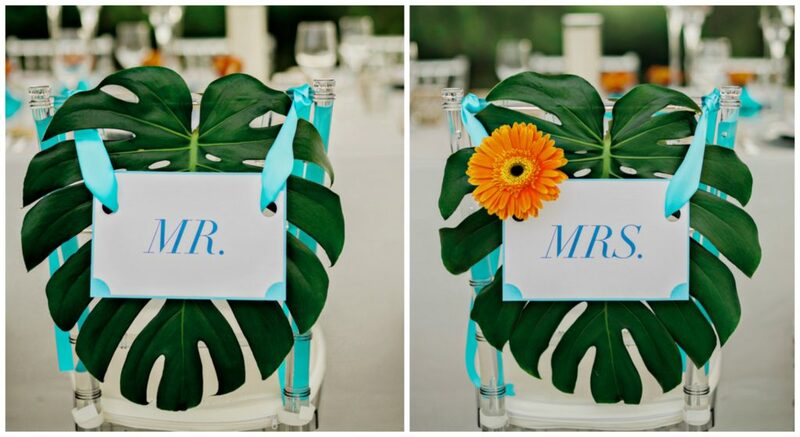 The entire shoot had a beautiful, tropical and modern feel. 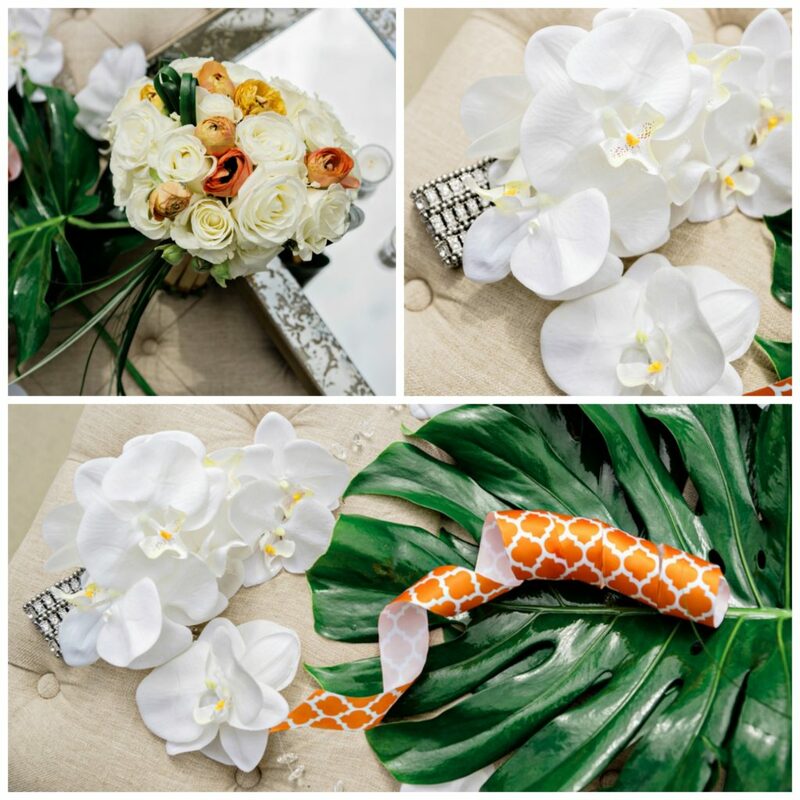 The top of the aisle featured gorgeous tropical arrangements created by Ambience Decor along with floating paper flowers in the pool to create a whimsical touch! 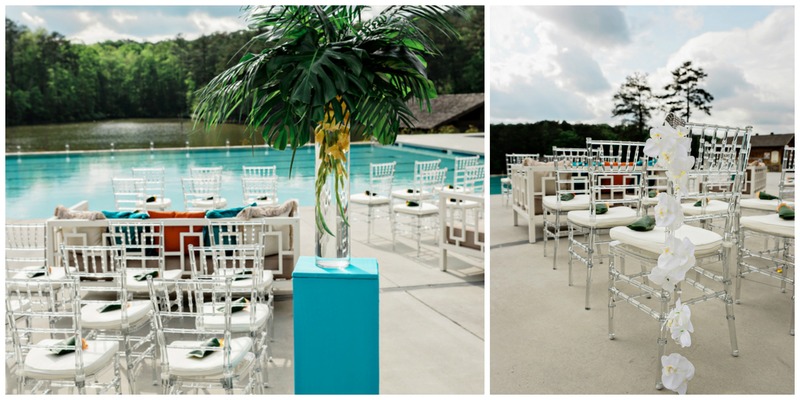 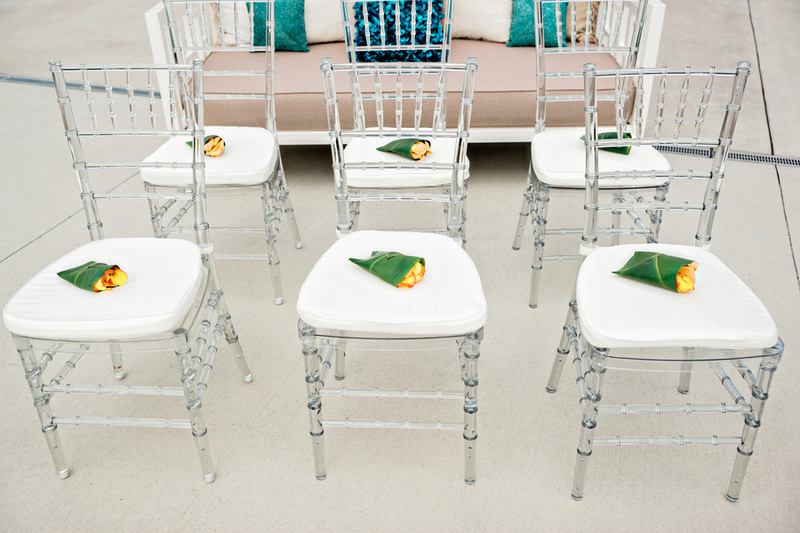 The ceremony area, which was placed right in front of the pool, featured ghost chiavari chairs from Sweet Seats and geometric lounge furniture from Crush Event Rentals. 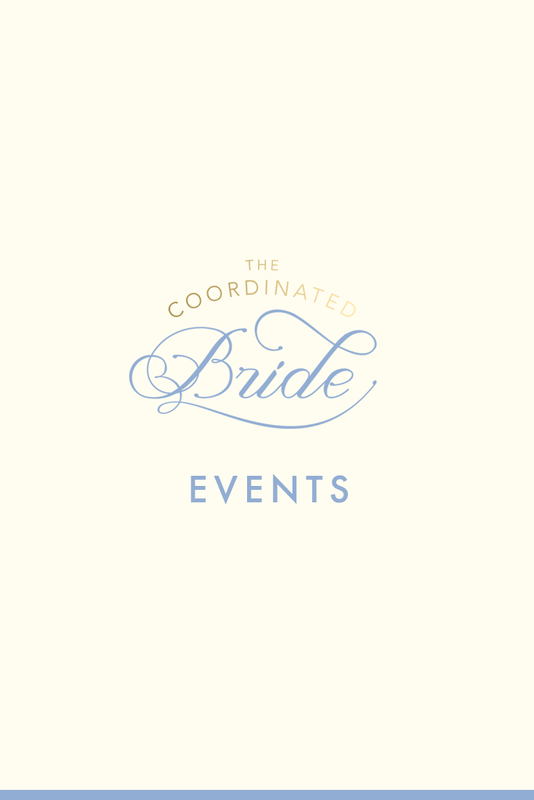 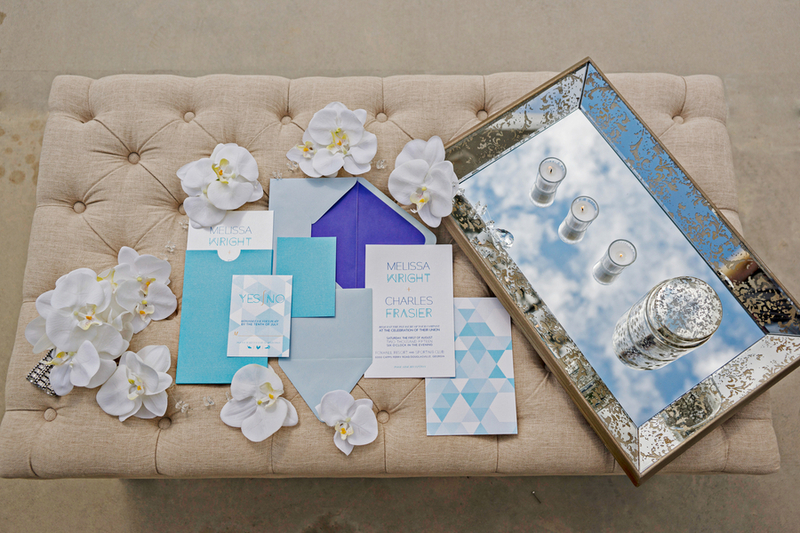 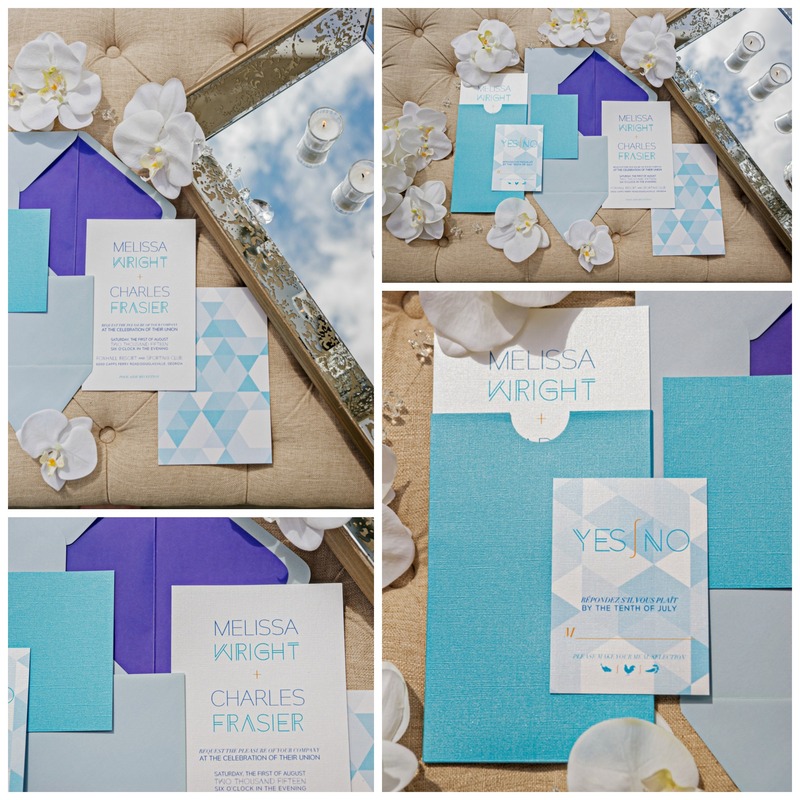 The invitation suite by Jasmin Michelle Design featured blue geometric designs with a slight sparkle for elegance. 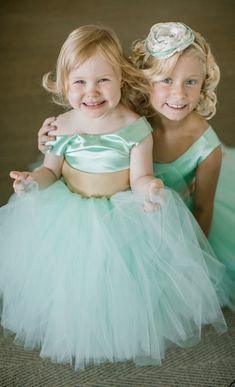 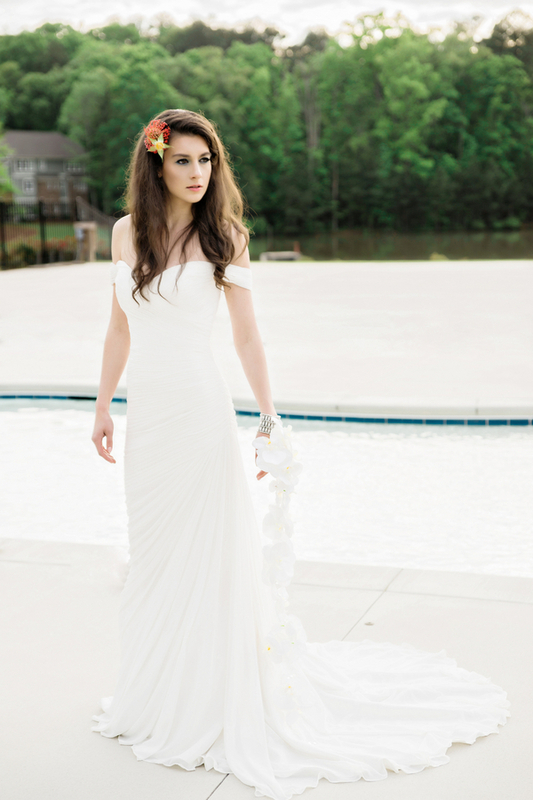 The gown, designed by Pronovias and available from Sweet Elegance Bridal, was a elegant and simple gown with a cap sleeve that really set off the modern feel. 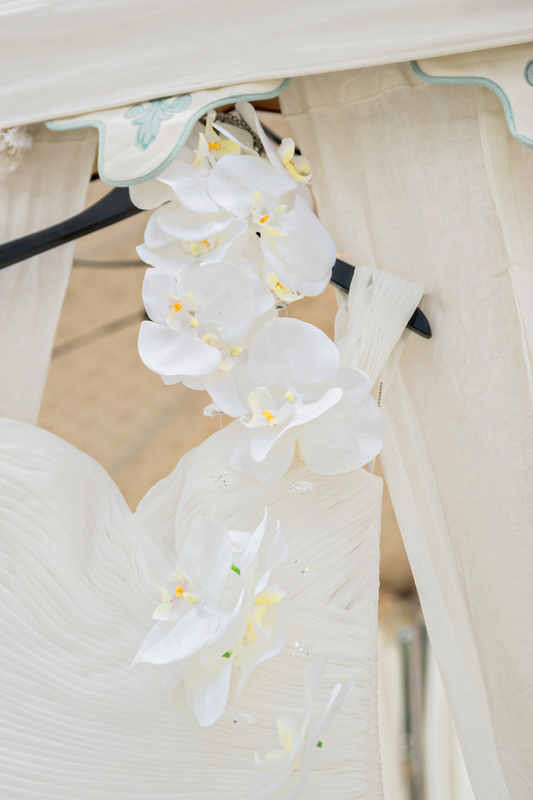 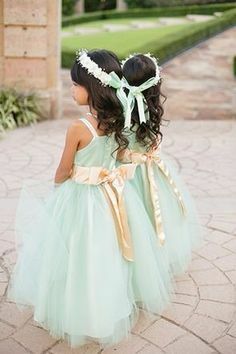 The gown also included an orchid bridal cuff which was the icing on the cake. 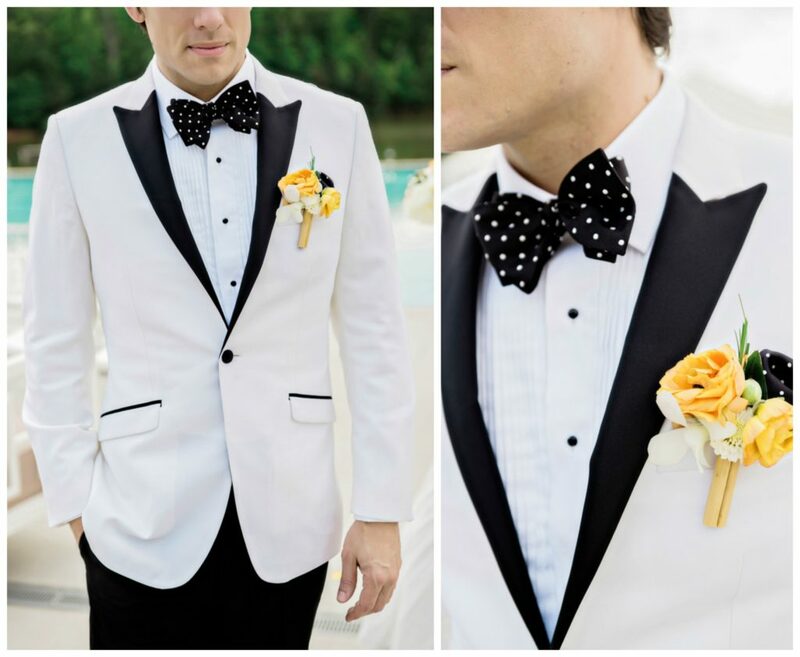 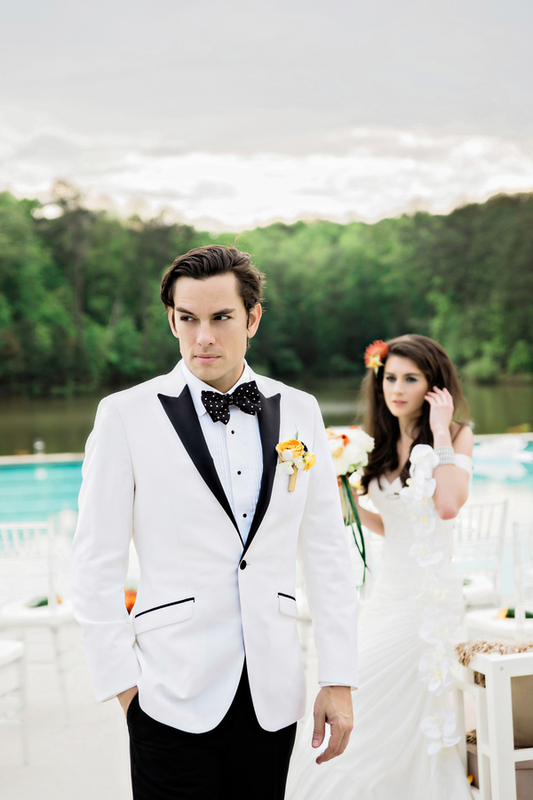 Miguel Wilson provided a tuxedo with a white jacket that included black accents on the lapel to match the both the pants and the black and white polka dot bow-tie. 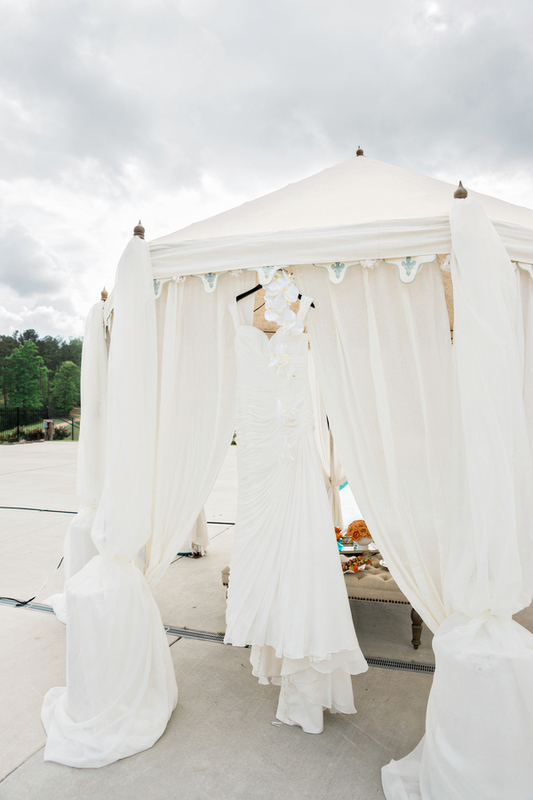 The reception area was set up under two tents provided by Peachtree Tents and Events and draped by Crush Event Rentals. 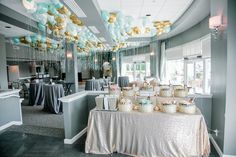 Both had Edison bulb lighting and chandeliers underneath provided by Unique Event Elements. 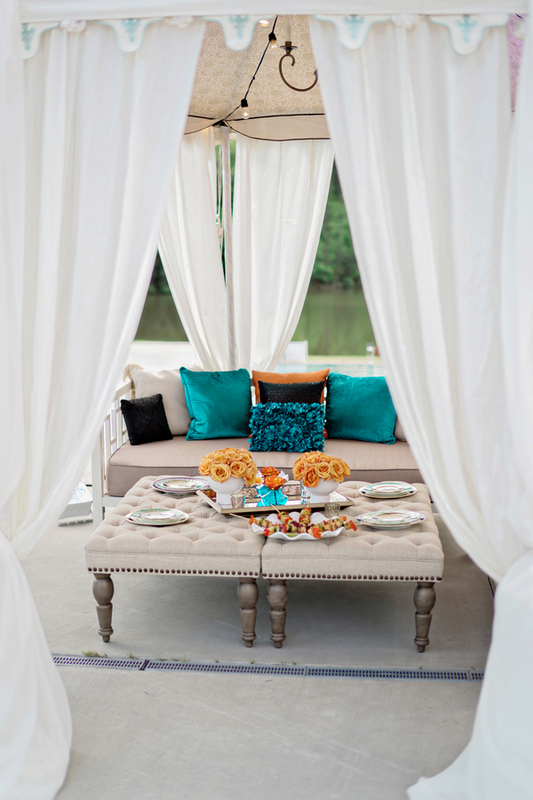 One tent had a very casual and relaxed ambiance that could be for used both for eating or lounging. 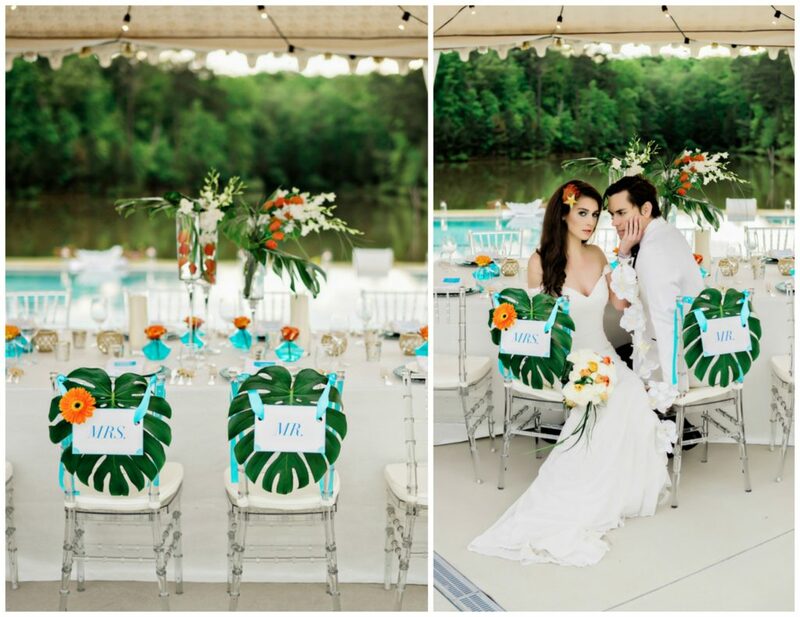 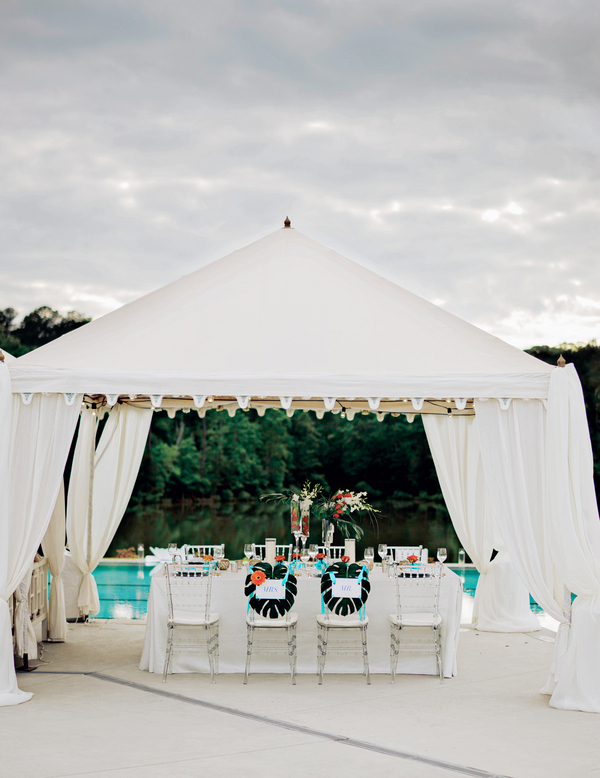 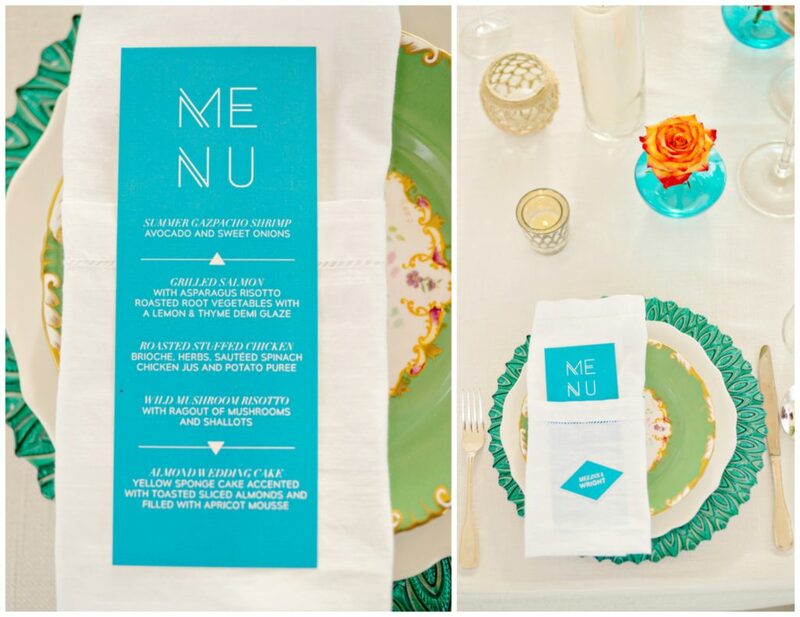 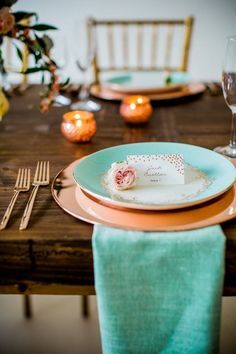 The second tent featured an estate table covered by I Do Linens with orange and blue accents. 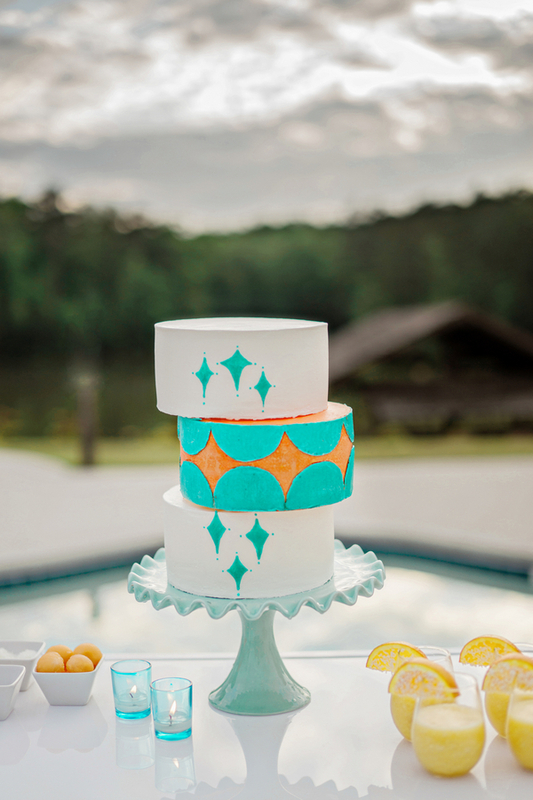 The cake from Eileen Carter Creations kept with the theme of shapes and included a geometric design in turquoise with orange accents. 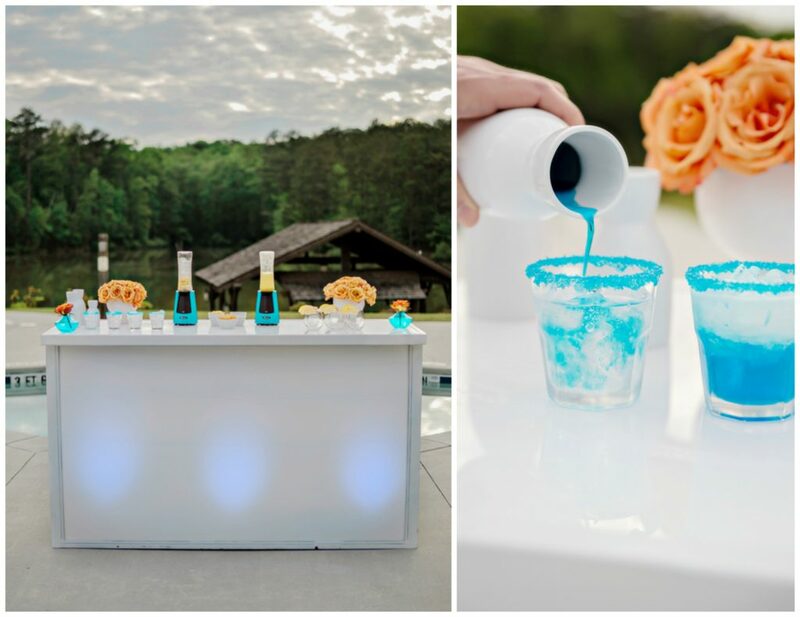 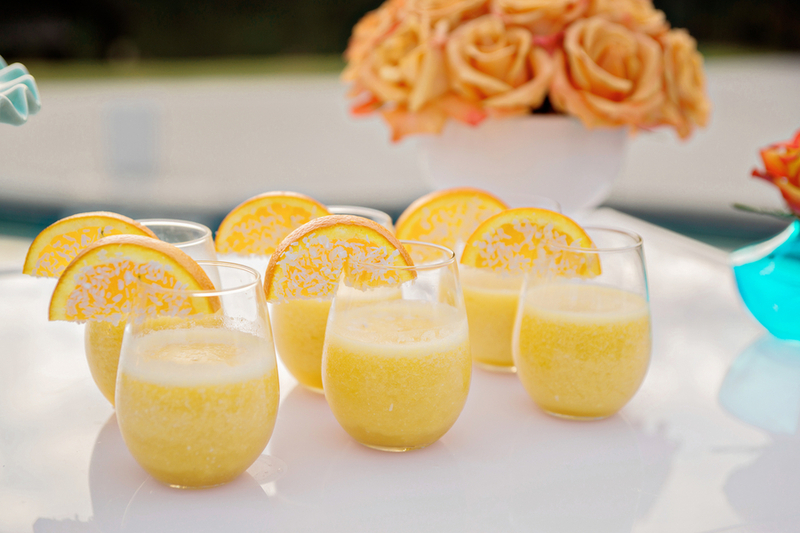 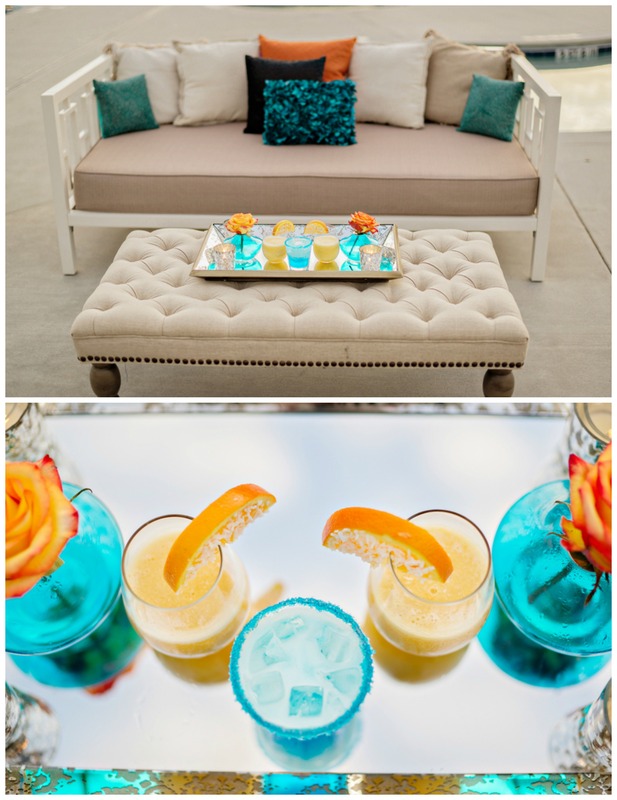 Simply Catering provided beautiful signature drinks in blue and orange colors as well, including a smoothie to cool off those hot summer guests! 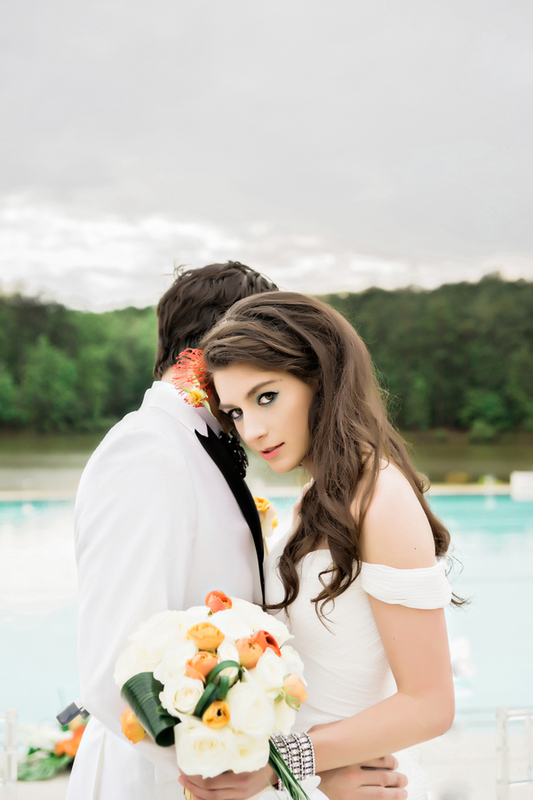 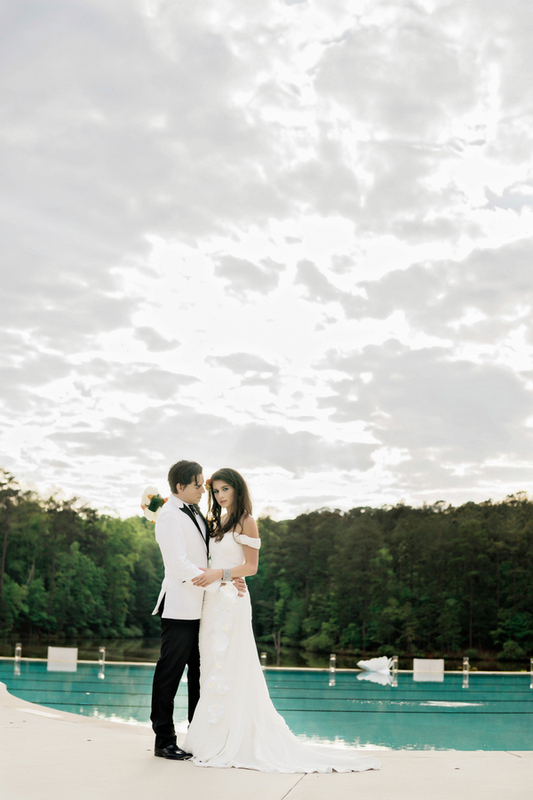 If you’re planning your wedding in Atlanta, be sure to check out Foxhall Resort and Sporting Club. 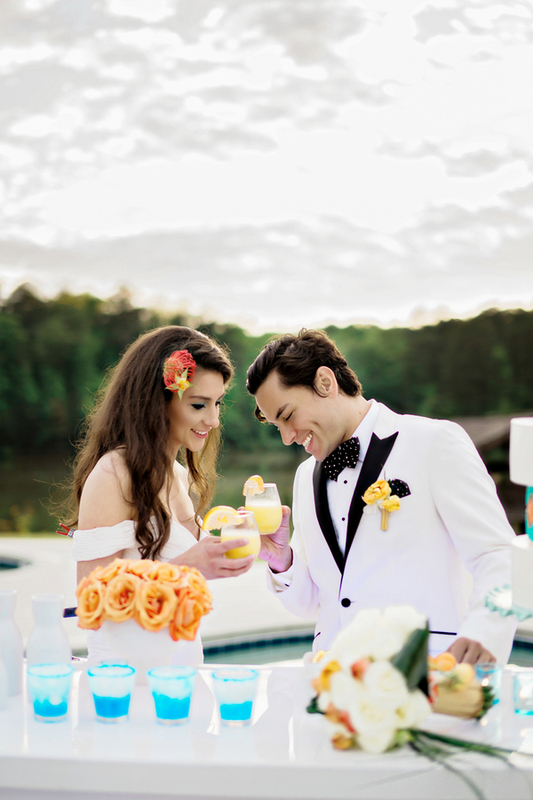 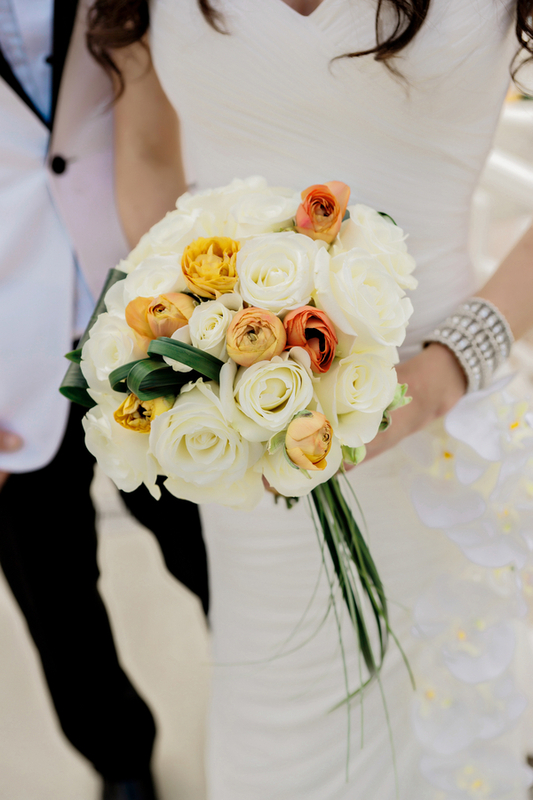 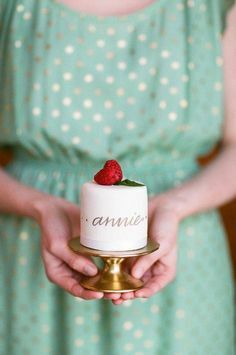 Check out all the stunning images captured by Andie Freeman Photography for some inspiration from this styled shoot!